This manuscript contains a set of poems by James Nicholas of Denmark (he flourished c.1360-73) written in 1363 in honour of Aymer of Valence, Earl of Pembroke (d.1324), whose widow Marie was Nicholas's patron, and founder of Pembroke College, Cambridge. On a flyleaf it has a late medieval ownership inscription (partly erased) of the College. 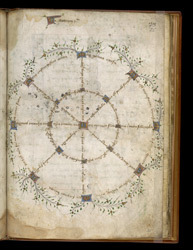 This diagram, headed '31st Metre', contains a poem laid out in a wheel shape to emphasise the poetic structure. The first eight lines are read outwards from the centre (the 'spokes' of the wheel), starting with that to the right; the next four lines are read around the inner circle, starting at the top; and the last four are read around the outer circle, starting at the top. This makes clear that every line begins and ends with a letter 'M', and the word in the middle of every line also begins with an 'M'.